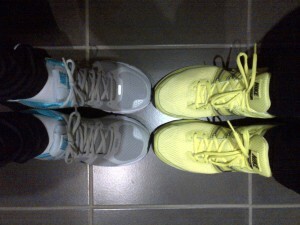 talkhealth > Blog > 2012/11 > Running is fun!! Well, we are one week into our half marathon training! So far we’ve done 3 x 1.2 mile runs – I know it doesn’t sound like a lot, but with 18 weeks of training ahead far better to start steadily and build up gradually than rush ahead too quickly doing too many runs and running too far! We certainly look the part having purchased new trainers and running clothes. We went to a fabulous specialist running shop in Reading where our feet were scanned and filmed, whilst running, to assess the best trainers to suit stance and running style. One week in and feels like it might be time to increase the runs slightly. I for one feel so much better from just this short burst of exercise. I actually woke up this morning looking forward to my 6am run! Long may it last!! 2 Responses to Running is fun!! Well done Deborah, keep it up! Starting is the hard part and building up gradually is wise. I prefer cycling to running but the same applies, plan it and enjoy it! Thank you Michelle. I think as you get older you need to think more than ever about exercise as well as what you eat. I’m sure the running will have huge benefits as does any regular exercise. So will we see you entering any cycling events?! ?